Given Russia’s climate and limited opportunities for developing renewable sources of energy, the country's best chance to create a viable alternative to fossil fuels to provide electricity and heating is the nuclear route, an expert argues. Russia inherited its nuclear energy sector from the Soviet Union and can take pride in the fact that the world’s first nuclear power station was launched in 1954 in the town of Obninsk, about 100 kilometers (62 miles) southwest of Moscow. In the 1970s-1980s, the sector enjoyed a period of exponential growth, but this was cut short by the Chernobyl disaster in 1986 and the breakup of the Soviet Union that followed shortly after. As a result, in the 1990s and the early 2000s, the development of installed capacity was in stagnation. In the post-Soviet period, only four power units were put in operation. Still, Russia’s existing 33 power units, with a total rated capacity of 24.25 gigawatts (GW) generate about 16 percent of all power in the country. Yet, this is far from the limit of the country’s ambitions. Ten more power units are currently under construction (including two reactors on the floating nuclear power station Akademik Lomonosov) with a total rated capacity of 9.2 GW. The plan is to increase the share of nuclear-generated power in Russia to 25-30 percent by 2030 and to 45-50 percent by 2050, which means the construction by 2030 of some 32 GW in new capacities, although by that time some of the current power units will already be decommissioned. There are several reasons for Russia’s ambitious plans for developing its nuclear resources. The first is that the Russian nuclear sector consists of some 500 enterprises with about 20,000 employees. These employees are divided among four major industry segments: creation of nuclear fuel, nuclear power generation, nuclear weapons maintenance and development, and research at scientific institutions. Russia’s list of nuclear assets includes the world’s most powerful icebreakers, which run on nuclear power. A large-scale program for growing nuclear power ensures a natural development for the sector and provides employment for highly qualified experts not only within the state nuclear holding Rosatom, but also in other sectors, such as machine engineering and construction. The second reason is an economic one. 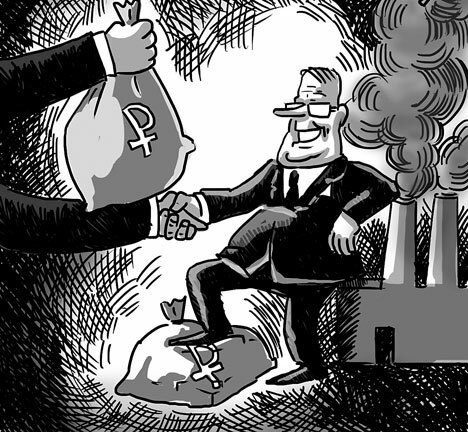 In developing its nuclear energy sector, the Russian government is achieving several goals. By increasing the share of nuclear power in the country’s energy balance, it is possible to maintain economic growth without increasing carbon dioxide emissions and violating Russia’s quotas under the Kyoto Protocol. In addition, the emphasis on nuclear power makes it possible to reduce domestic consumption of oil and gas and reserve these resources for export, which is far more advantageous from the economic point of view than selling them at discounted rates on the domestic market. Additionally, transporting oil and gas to thermal power stations across Russia is logistically difficult and expensive, which makes exporting them even more cost-effective and beneficial to the economy. Finally, given Russia’s climate and limited opportunities for developing other renewable sources of energy, such as solar power, nuclear energy may be Russia’s best chance to create a viable alternative to fossil fuels to provide electricity and heating across the country. The third reason for developing its nuclear resources is the growing prospects for the export of nuclear technologies. Russia’s nuclear energy sector is becoming a major world exporter of nuclear power units. Russian nuclear power units operate in countries ranging from China and India to Turkey and Slovakia. There are currently five Russian power units being built abroad, with 13 more under contract to be built in the next several years. Discussions are in progress for at least 10 more units. In addition to exporting reactor technology, under these contracts Russia agrees to provide fuel, components, spare parts and services such as maintenance and spent fuel recycling for the duration of the reactor’s life, which could be as much as 60 years. The value of these services to Russia’seconomy is far greater than the sale of the reactor itself. Another important reason for the continued development of Russia’s nuclear sector is the country’s security. The existence of a strong civilian nuclear energy sector ensures effective operations of its nuclear weapons complex. In addition, civilian orders keep the sector’s dual-purpose enterprises busy. For example, it is now clear that the Rosatom-funded program for the construction of a floating nuclear power station, which was heavily criticized in its early stages, has allowed Russia to retain its ship reactor technology, which was later used to expand the nuclear icebreaker fleet. This fleet, in turn, is becoming ever more important for the global shipping industry as more goods are shipped through the Northern Sea Route. Nuclear power is important for Russia’s continued economic development for reasons far beyond maintaining military readiness. Keeping up with the latest technologies in the sector keeps thousands of highly qualified Russian scientists employed. It is also Russia’s best chance to develop renewable sources of energy. And nuclear energy has the potential to be an important export for the country, one that perhaps someday could counter the Russian economy’s long-standing dependence on fossil fuels.